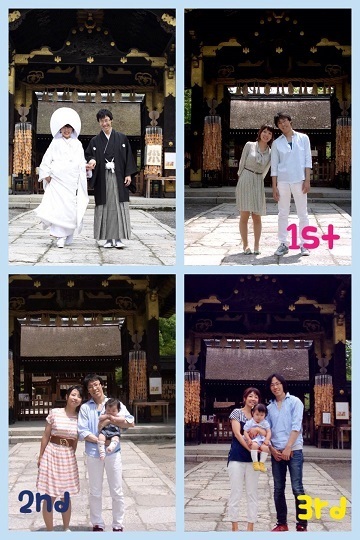 Yesterday, Mr.and Mrs.Y who had got married on June 11th three years ago visited LST office. They came to see us on their wedding anniversary every year, and this was the third time. I could not see them last year as I was on maternal leave, so I met them for the first time in two years. 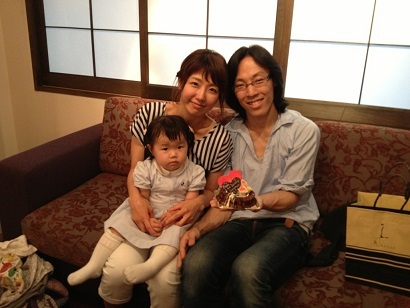 Their daughter, Azusa turned already 1 year old and moved around actively. She was so cute. My daughter and Azusa’s birthday are so close, they are just 10days apart. And as we have so much in common as working mothers, we could not stop chit-chatting for a long time. It was fun to talk about marriage and child-raising with Mr. and Mrs. Y.
and then had lunch at the restaurant “MUTO” where they had held their wedding reception. However yesterday was the regular holiday of the restaurant and they couldn’t visit there. So, we prepared some cakes from MUTO and it made a nice surprise for them. Their happy faces made us happy too. Later, she wrote us an email with lovely photos. The email said “For the past one year, I’ve been so busy every day as I had returned to work. Honestly speaking, I rarely recall our wedding ceremony or the days we were preparing for it. But each time when we visited you on our anniversary, it reminded me of our wedding day which was the beginning of our new life. I think it’s wonderful that Mr. and Mrs. Y value the wedding anniversary highly. We are looking forward to seeing them again next year!